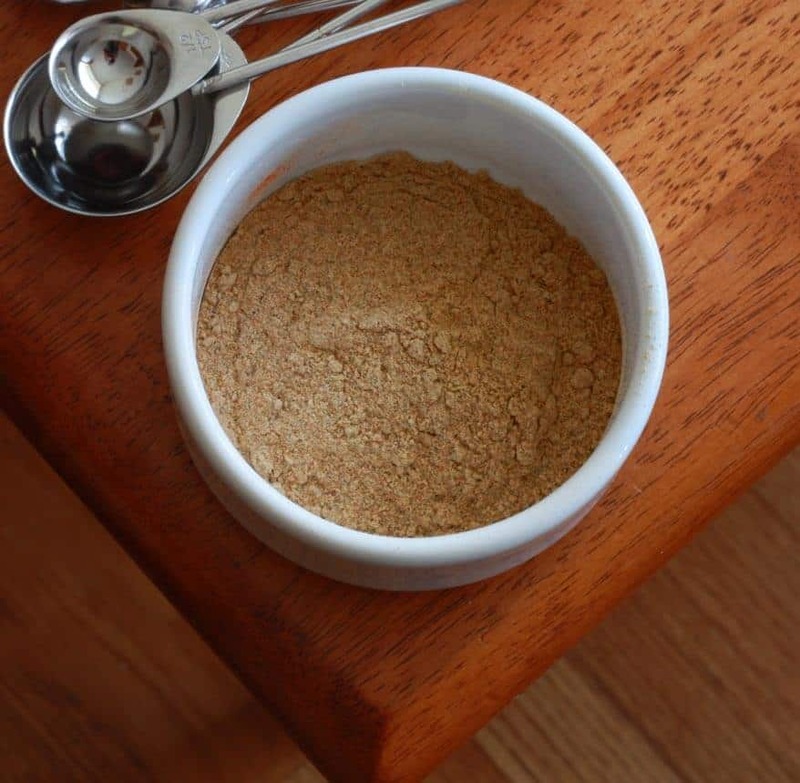 Several years ago I spent some time trying to develop the perfect all-purpose Greek seasoning, experimenting with ingredients and ratios. I finally cracked it at that time. And now I’m going to unleash that secret and share it with you! This is an excellent blend to use in any recipe that calls for Greek seasoning, or as an all-purpose spice blend. You’re gonna to love it! This blend is what’s used in these absolutely fabulous Greek Gyros, which you are guaranteed to love! Combine all the spices and grind them to a fine powder in a spice or coffee grinder. Store the Greek Seasoning Blend in an airtight jar until ready to use. 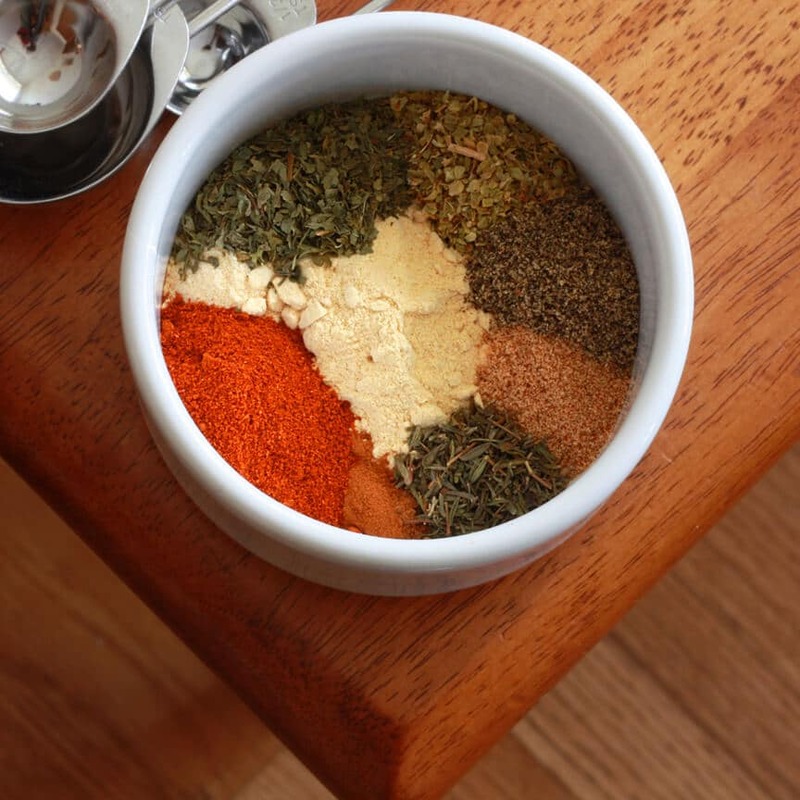 A fantastic blend to use in any recipe that calls for Greek seasoning. 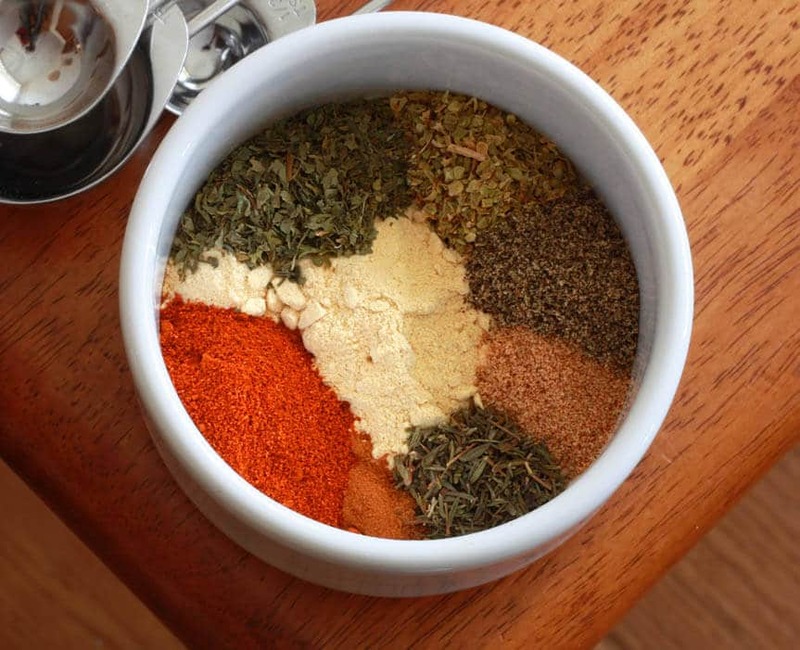 Combine all the spices and grind them to a fine powder in a spice or coffee grinder. Store in an airtight jar until ready to use. Wow, this is so neat! Okay, I finally did it. I printed out this recipe when you first posted it with great intentions and I finally made this seasoning two days ago. Then I cooked it with chicken to make the gyros. It was yummy. I was intrigued by the sweet flavor the cinnamon adds to a savory dish. Thank you! I bought a “Greek” seasoning a year or so ago that included spearmint, but can’t find a recipe that I can use to duplicate it. Are you familiar with one? I’m on a keto plan that also doesn’t include any soy, and most beef bullion powder has some form of soy, so I probably wouldn’t add the bullion to it. Hi Joyce, the bouillon is what really adds that “umami” depth to the seasoning. As a substitute you might consider using another umami-rich ingredient that’s keto-friendly…dried ground porcini mushrooms come to mind and might make a really nice addition (I’d use just 1 teaspoon). Otherwise you can simply omit the bouillon and any substitute. Following the ingredient ratios of this seasoning blend I’d recommend adding 1 teaspoon of dried mint. Hey Tom, cinnamon is one of several spices referred to as “sweet spices,” including allspice, anise, cloves, fennel, and nutmeg, to name a few. They actually cause a chemical reaction in the brain that creates a sense of sweetness. How much should I use for a pound of ground meat? Hi Ron, I like a lot of flavor so I’d probably use 3/4 of the entire batch of seasoning. Hi Kimberly, I want to double the batch but was wondering about the beef bouillon. I only have cube. Could I use that instead? How much of it? Hi Jennifer, the bouillon cubes tend to be a little moist inside which will make your seasoning clump together. I guess it depends on how you’re using the seasoning. If you’re simply adding it to something that’s going to be cooked anyway, then no big deal. If you’re needing to sprinkle it over food, I recommend getting bouillon powder. Thanks. DO you think I would use half of the bouillon for doubling the recipe or use the entire cube? Hi Jennifer, two teaspoons of powder make two cups of broth. So it depends on the size of your bouillon cube. Is one cube for 2 cups of broth? If yes, then use two cubes if you’re wanting to double the recipe. Also, different brands of cubes vary in saltiness so whatever you’re using this seasoning blend in, first taste the dish before adding any extra salt. Enjoy! This is amazing. I’ve tried and failed many times at making gyros like the ones you get in Greece. NOT ANY MORE!!!! Fantastic! So glad you enjoy this as much as we do, Neil, and thank you for the feedback! Wanted to make gyros tonight but couldn’t find the prepared meat I have used in the past so I bought some shaved steak and started looking for a spice mix. Eureka! I found your page — and fortunately had the necessary ingredients on hand (substituted chicken bouillion power for beef – worked great). Prep was easy, and the food was all on the table when my wife arrived home tired. She was going to skip dinner and lie down until she passed by the pan of prepared gyros and the scent captivated her. She had three forks full before she even sat down to make her sandwich. She lived in Greece for a year and she knows good Greek food and this got a 100% rating. Three sometimes picky teens also loved it. It’s all about the spice and your blend is outstanding! !! Thanks for posting your “secret”! Hi Kimbery I am a vegitarian what I can use to replace beef boullian ? Hi Nalini, the beef flavor is an integral part of the seasoning but you can use vegetable broth instead, it just won’t taste quite the same. The lamb might be an issue too. No? I mean Gyros are gonna be animal based. Maybe a salad would work better…. 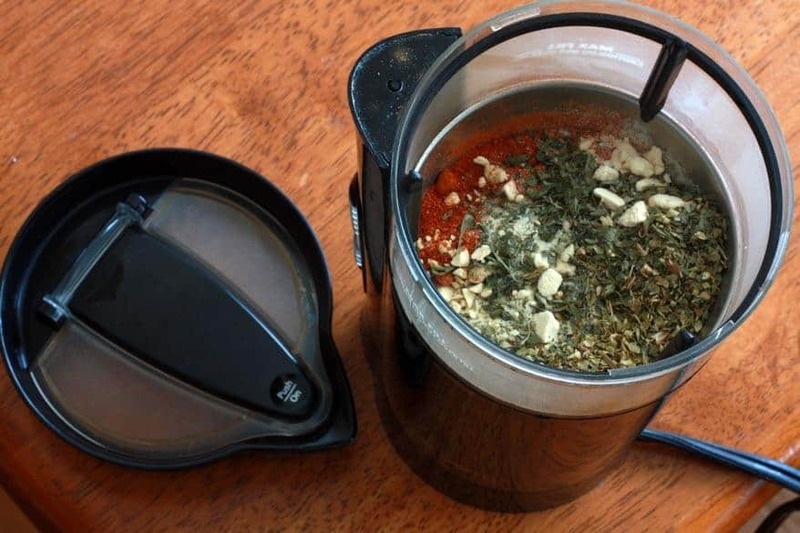 Do you think the spice blend would have to be ground, or could I just mix them together–I don’t have a grinder. No, you don’t have to but the problem is that the ingredients have different weights and consistencies and some will tend to float to the bottom or top so when you use it for sprinkling on things you won’t get an even mixture. 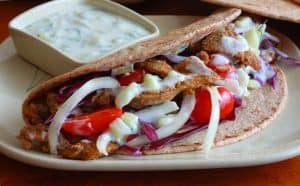 If all you’re doing is taking the whole batch and adding all of it to a dish (like the homemade gyros), then it’s not a problem. I use cavenders all purpose Greek seasoning. is it similar to your mix? Sounds great, I am out of. Bouillon, Any suggestions? I ‘m cooking tonight… thank you so much! Hi Mary Beth, there’s really no substitute for it so if you can’t get it for tonight just omit it. Happy cooking! my son ate gyros in hungray and fell in love with it. it seems that hungray greece and turkey all share the same item. i went thru many recipes in the net but i think i will try urs. thank you for the clear step by step photo instructions. Hi Lamia, there are similarities but the seasonings will vary from country to country. I think you’ll both really enjoy this one – the homemade seasoning is really key. Happy cooking! Hi Kim. Did you, by any chance, try allspice instead of cinnamon in the combination? I am obsessed with trying to find that Greek smell that floats around the greek restaurants. My conclusion is that combined with all other spices, the essential greek taste must be allspice and nutmeg..:-) I will try your combination. I am very excited. And I will try the allspice, too, which is also cinnamony a little, so that the nuance is not lost. That would be a nice addition, Aurora. I’ll have to give that a try next time as well. Happy cooking! We doubled the spice recipe and mixed that with 3lbs of ground pork and it made perfectly spiced gyros. Thank you so much for posting this awesomeness!! I drooling and want to make this today. For the tomatoes, plain diced or fire roasted; does it matter? Thanks! Hi Ronni, I’m at a loss – are you referring to a another recipe? Please review your instructions for fresh ground pepper quantities; if we follow your premise that fresh ground occupies less volume (which in itself is wrong, as pre-ground spices compact over time; you don’t even need to grind any pepper to prove that, simply get your container of pepper and transfer some to another vessel, let’s say a shot glass, using a funnel, stop when full and tapping it on its side will magically create some more space to fill), your 2 teaspoons freshly ground would be equivalent to more than, not less, of already ground pepper. Aside from that, as Greek as cinnamon might be, it is not a part of traditional gyro recipes, nor is nutmeg. Your mix might be tasty, but no different than those cooks who surmise that throwing feta and Calamata olives in a recipe makes it “Greek”. I and most other Americans have not been to Greece. However, I can be fairly certain that the culinary history of Greece as a country follows most, if not all of the many and diversified paths that other countries (and regions) have followed over the centuries. Until the 20th century, people living in most countries rarely traveled more than 50 miles from their home. And the food they prepared was made from recipes based on the ingredients available within 10 or 15 miles of their home. Therefore, there often were huge regional differences on how one prepared a particular dish. And what fun they had arguing about which recipe was the best and/or authentic. There are some ingredients that, while excellent quality, do not “travel” well and therefore are substituted, even today, by local or other ingredients that travel better. Here in the USA, we often craved the “tastes of the world” but again, until relatively recently some of the ingredients were not available in one part of our country or another. Each cook did the best that they could with the ingredients available and we ended up with many regional recipes for the same dish. That is probably the reason that in the USA, the farther you are from, say, Mexico, the less authentic the Mexican food available to you is. That does NOT mean that one region’s version of a dish is better in any way than another region’s. It DOES mean that the people of that region have become accustomed to the version of a particular dish made with ingredients that were historically available to their ancestors. Please keep this in mind when judging someone else’s culinary efforts. How much does this entire batch make ? 1/4 cup? Hi Susan, yes, about a 1/4 cup. I love this mixture! I recently started cooking for a Kashmiri & he misses his home-type foods. So I’m learning as much as he is(men don’t cook there, so I’m making both of us learn,lol) I omitted the onion & black pepper,& added allspice, rosemary, & coriander. I use it w/ beef ribs on a 3 hour slow simmer w/ a can of beer to give it that malty, rich flavor. In a pinch, 1/2 can Dr. Pepper works, but it won’t be exactly the same. 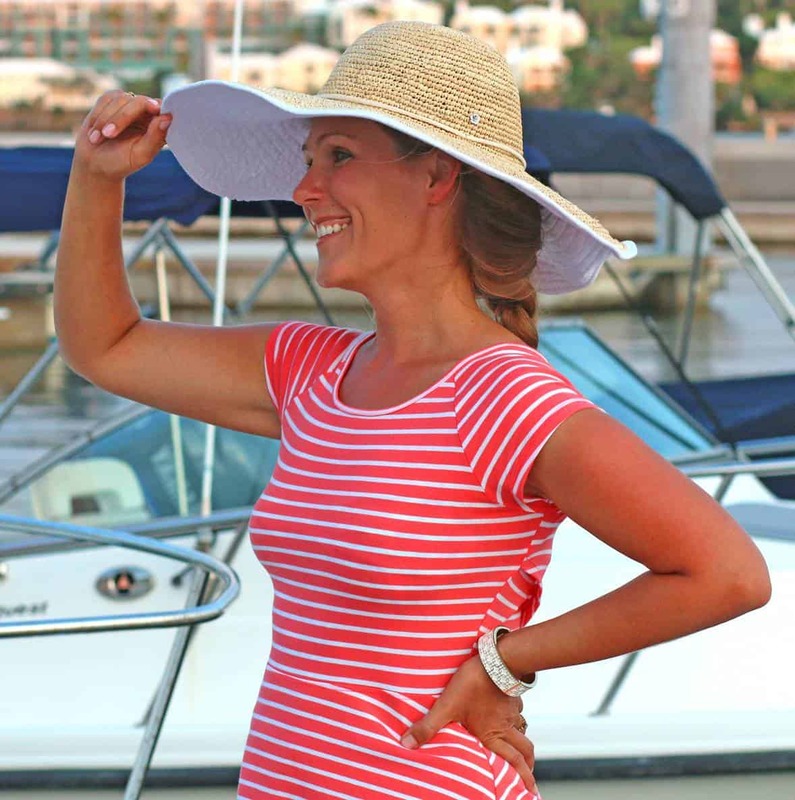 That sounds awesome, Kelly, thanks so much for the feedback! I have 4 lbs of lamburger. I want to make gyro meatballs for Christmas. If I double this recipe do you think that would be an appropriate amount of the spice mixture? In general how much of the spice blend to mix with a pound of meat? Hi Vicki, this makes approx. 8 tablespoons of seasoning mix. I would say about 3 tablespoons of the seasoning per pound of meat. What I would do is start with that amount, break off a bit of the seasoned ground meat, fry it up and taste it – then you can determine if you want to add more. Ok, I made this, but I did not have beef bullion and I did not have parsley. It was still tastes great without it. I used this on chicken. I will definitely be using this again. I do not have a coffee grinder and I think it would be better if I did grind it all together. I saw gyro seasoning at the store, but it was loaded with msg and didn’t want that. S9 glad I found this recipe. Thanks for posting it. I’m glad you enjoyed it, Diane, thank you! If you make it in a larger quantity you can also try using a blender. This was so good. I placed 5 frozen breasts in the crock pot along with some broth, cooked it overnight and then wanted to slice it but it ended up being shredded I made your seasoning and poured about 1/2 of it in with the chicken along with some of the broth. So good. I am having company for lunch and usually I don’t make something new but I was today and I am so glad I did. I’m so happy to hear that, Debbie, thank you! We are not cultural at all, but like to mess around in the kitchen. We got out meat for fajitas, but didn’t have enough Mexican ingredients so looked up Greek on a whim. Your blend got an A+ from both of us and our 4 young children! We used the entire recipe (minus parsley because we were out) on approximately 3-4 lbs of sliced flank steak. It was slightly spicy but not enough to be minded by the kids. Served with flat bread and the only veggies in the house–carrots and radishes. A creamy sauce would have made it completely over the top! I’m so happy to hear it was a family hit, Rachel, thank you! Celery seeds aqre a good addition too as they give that slight aniseed taste often found in Greek dishes, fennel works too! THANK YOU! i HAVE TRAVELLED EXTENSIVELY TOO AND IN PARTICULAR nORTH Africa so am conversant with many meditterranean spices, always wanted the Greek mixture as it’s no difficult to find in the grocery stores. I use Harrissa a lot to give food heat and it’s perfect.